Speed is considered all-important in the modern ad world. And it is critical. But so are results and accountability. So is creating advertising that people don’t blow by or dismiss the moment they consume it. That’s why our new mascot is a tortoise. Okay, it’s not just a tortoise. It’s a very, very fast tortoise. We talked about being the hare. Lots of prospective clients probably like rabbits. But we don’t want to lurch forward and have nothing to show for it at the end. We don’t want that for our clients, either. We still believe thoughtful strategy and powerful creative will win the race. We’re just thinking and creating faster than ever before. With more fast-twitch muscles across every department. And a hard shell to deal with the relentless adversity and competition our clients face every day. 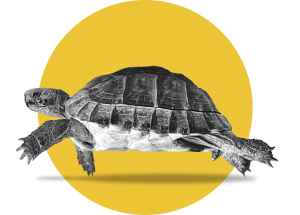 To recap: barrettSF is a fast, fully-evolved, strategically-grounded, media-agnostic, and creatively-driven tortoise. You might think that would make us different from the competition.